The entire Class of 1963 Google Earth map is a file that works with the free program, Google Earth. 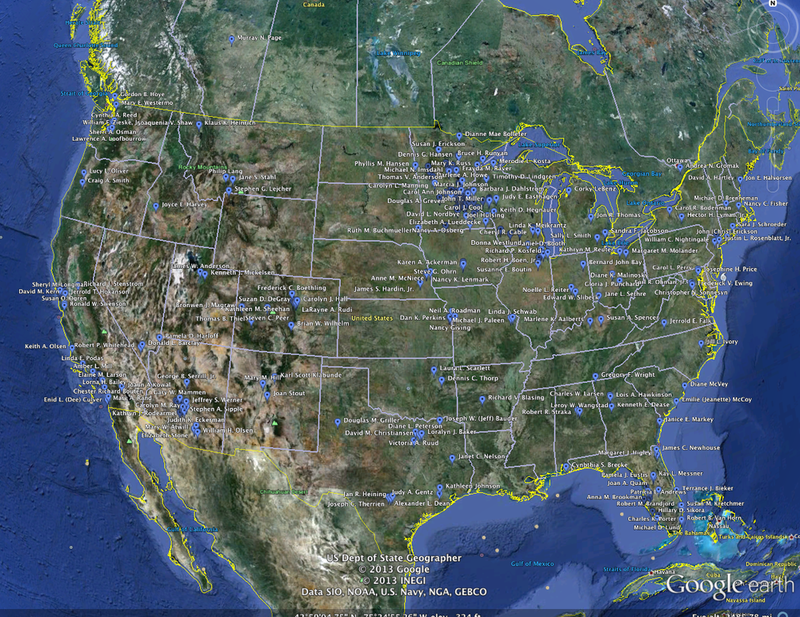 It encompasses much more than the U.S. shown here, and you can zoom in to smaller places. First, download and install the latest version of the Google Earth application. Then download the Washburn ’63 file (‘click’ on the following: Washburn63.kml). A file will download to your computer. Double-click on the WHS file or drag it onto your Google Earth app icon. Give it a moment to place the pins and focus the globe. Spin the globe! We’ve wandered afar. See who lives near you. Look for an old friend. Help us find the Missing Millers who are not shown.